Mixed Media Artist Dyan Reaveley's unique eclectic style comes through in her vibrant color combinations of inks and paints, her use of text as an insightful design element and the clever use of imagery in her artwork. 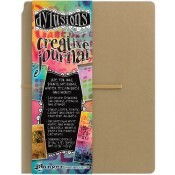 You will find Dylusions Spray Inks, Dylusions Stencils and Stamps, Creative Journals, Technique Books and tools. These products are great for Art Journaling and Mixed Media as well as to create cool backgrounds for your scrapbooking and card projects as well!